It’s Friday, and I’m off, thank goodness (our office is always closed on Friday’s). Greg works rotating shifts, which can be tough and is why I am happy to work 4 days a week. He’s working this weekend, so I plan to entertain a very energetic toddler. We might head to the library; we haven’t been to the local one since we moved. House stuff: We finally got the downstairs of our house mostly decorated. I think Ellie has at least as much furniture as we do – a table and chair, a mini workshop that used to be Greg’s as a kid, a play kitchen, an armchair, and a rocking horse. So basically, half our downstairs is owned by a tiny toddler and it’s like one big playroom. I’m okay with that. 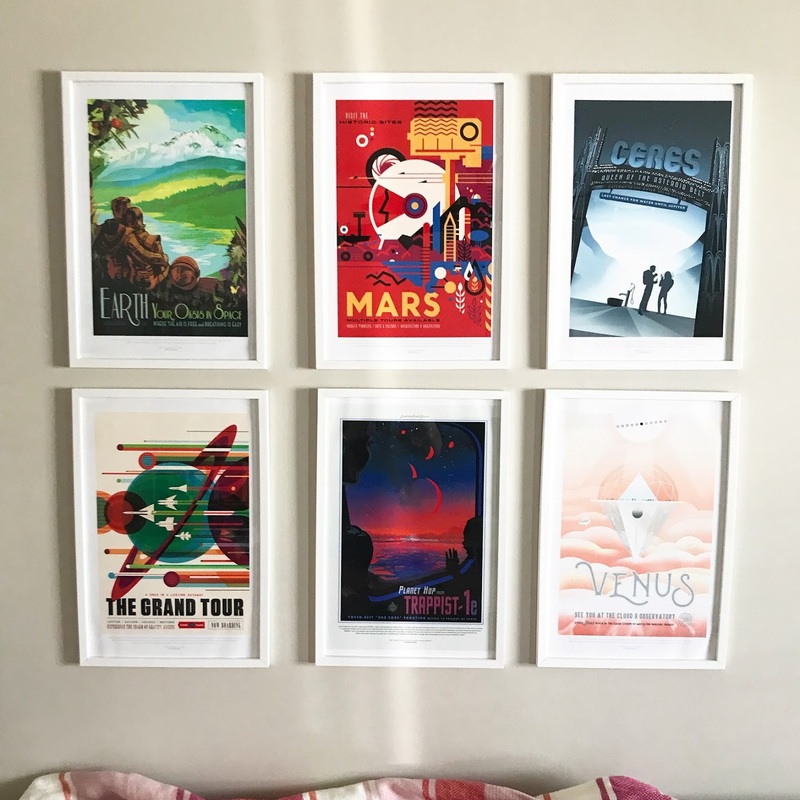 We decorated above the couch with these posters from NASA. We just had to print them and order frames. I think next up for house decor might be our bedroom, because it is fairly empty right now and it’s a big room. I’d rather have had a bigger bathroom; not sure yet what to do with the bedroom space. There’s no rush on figuring it out, though. It might not even be till next year, since we are still getting a feel for our budget. Going outdoors: It went straight from cool to HOT here, which I think is happening in a lot of places. It’s been humid with the tropical storms that have been coming through south of us. Ellie would live outdoors if she could. She is always demanding we go outside. She’s actually always demanding a lot of things. It’s like living with a tiny dictator. I await her instructions. Often, while I’m sitting, she pokes me and says, “Up! Up!” which means I need to follow her. 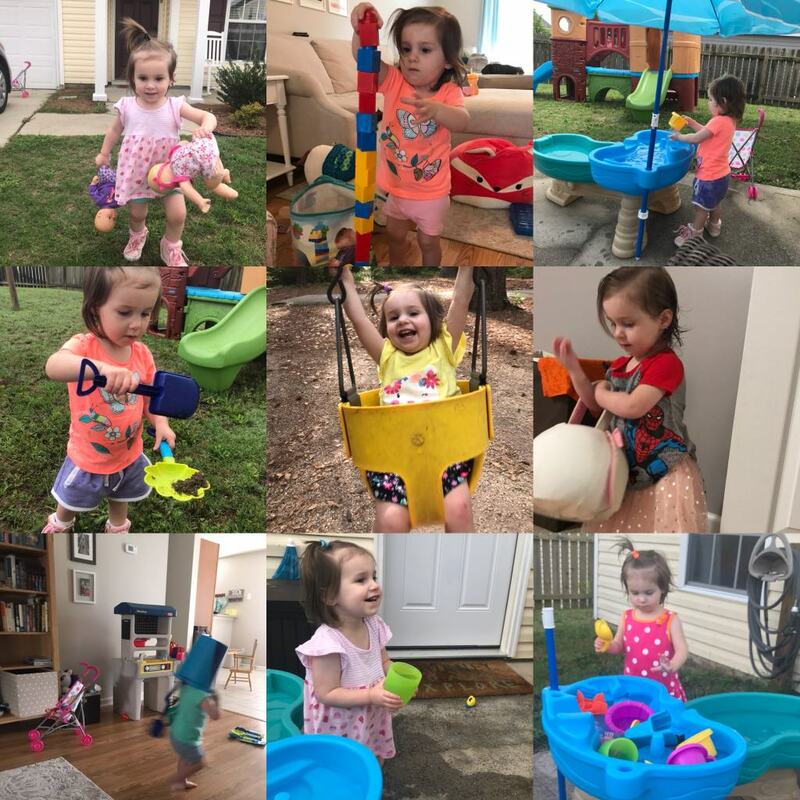 She’s been enjoying the water table and playing in the dirt, although she does NOT like getting a mess on her and will wash it off right away. She has two baby dolls that MUST go with us everywhere, even in the backyard. Usually, I am the designated holder of the babies. She doesn’t have a ton of words yet; she has figured out the word ‘no’ for sure. She says it gently and thoughtfully. If I ask her, “Do you want to take your blankie off?” (it’s a sleep sack), I usually hear a small “…..no.” She has been learning more and more words in the last couple months – it’s amazing. Watching: I have been watching a few different shows. I finished up the first two seasons of Fargo and ran out of episodes on Hulu. That show is wild – extremely violent and cinematic. I’m not a fan of violent shows but it hooked me – it’s also weird and funny. Then I watched the first season of Legion, another weird and cool show. It made me want to see some other Dan Stevens stuff, so maybe I’ll give Downton Abbey another shot. 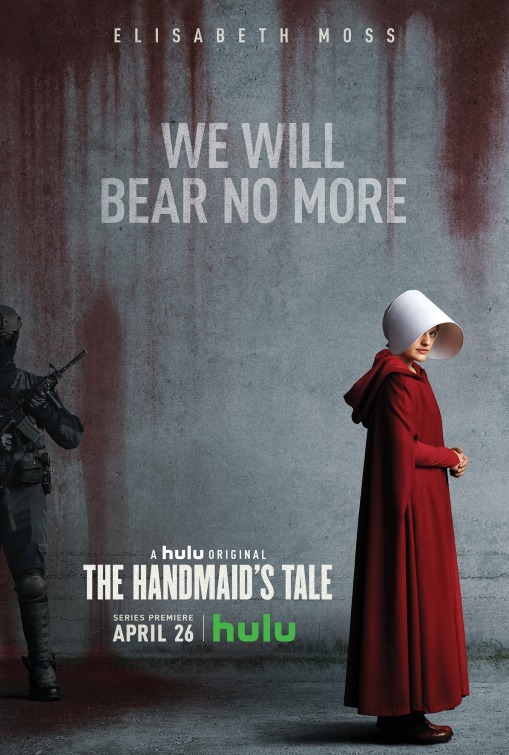 I just started watching The Handmaid’s Tale. I watched the first episode and that was rough. After I finished, I felt like I just watched my nightmare. But it’s a good show and I’m going to continue it. 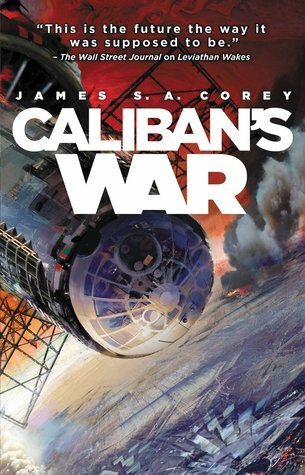 Reading: I’m finishing up Caliban’s War (Expanse #2) by James S.A. Corey. I’m not usually a sci-fi book fan and I’m digging it. I got into it because of the show and it follows the book pretty closely. I’ll probably take a break from the series after this to read something else on my shelf. I read that the series got canceled by Syfy and then picked up by Amazon, so hooray! I’ve seen the first two seasons and will catch up sometime. Hope you’re having a good Friday and enjoy whatever you have planned this weekend! I’m linking up with Steph & Jana for Show Us Your Books. It’s been a long time, so I’m going to do my best in recounting these books! The characters and story were right up my alley. I love a fairytale, especially one I have not heard before, and characters with a mythological feel. I could describe it as a little bit of Neil Gaiman and foreign fairytale. Ghost story told in multiple, short parts over many years. If you enjoy haunted house stories, you would probably like it. No gore or terrifying bits, just some good, old-fashioned creepiness. I knew this would be stepping out of my normal zone a little, and it wasn’t for me. I wasn’t a big fan of the characters or the new story. To be fair, I also watched Beauty and the Beast (animated) again a couple years ago, and it was hard for me to enjoy it like I did as a kid. Belle used to be my favorite Disney princess, but I think looking through adult eyes, I can’t set aside my adult brain and make it stop complaining. 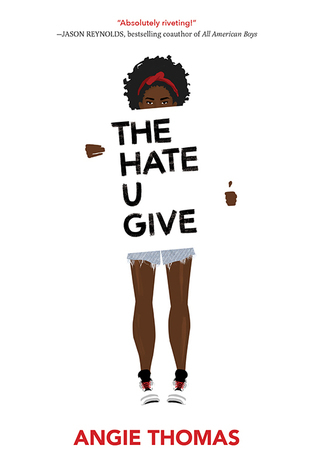 I loved the movie and I am glad I read the book. I also love that this was set in Philadelphia, because it’s somewhere we used to frequent. 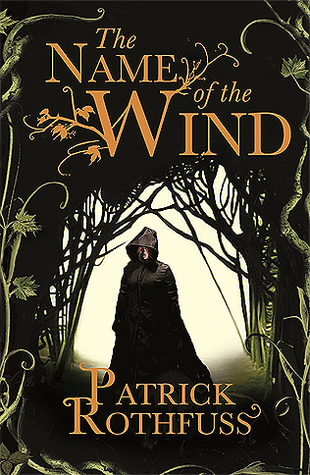 The book focuses on Pat as he is dealing with mental illness. 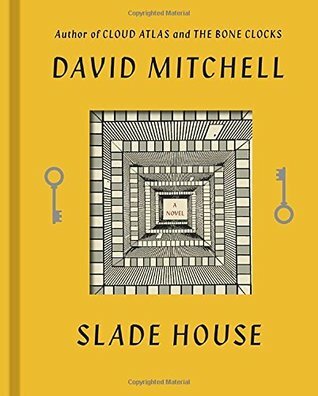 If you’re into modern stories about mental illness and family, I recommend it. 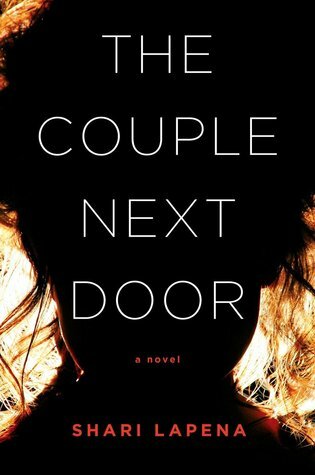 A good-enough thriller – a woman on a train watches two girls being flirted with by two young men. The next day, one of the girls has disappeared. The woman feels guilty and also starts receiving threatening letters. 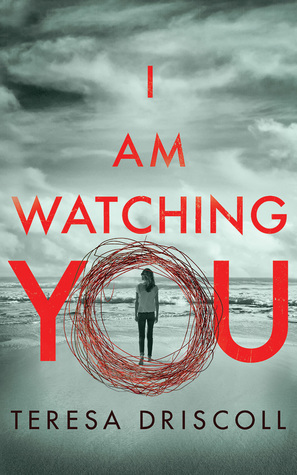 Honestly, I read this book several months ago, and sometimes thrillers don’t stick with me. This one was good while I was reading it, but didn’t have me hanging on the edge of my seat the entire time. This is a fantastic series. I always almost give these 5 stars, but it has its lulls and peaks. Also, super violent. I highly recommend if you are into space and Hunger Games style battles. This is a reread for me – it had been several years since the first time I read it. I still loved it, although I was a little more annoyed by the male perspective and how he views Denna as incredibly perfect and spends way too much time describing her face. 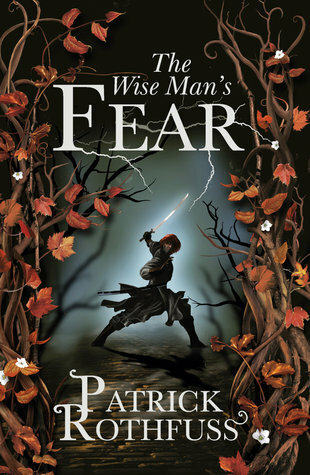 Despite that, I love the story, I love Kvothe, and Patrick Rothfuss is a wonderful writer. We learn more about Kvothe! This would probably also be 5 stars, but he spent FOREVER with Felurian. This story traveled outside of the school setting, where the first book was set, and it was nice to read about some new places, new trouble he runs into. I recommend if you love adventure and romance! I hope that one day he will finish the series. Predictable plot, but I was hooked anyway. I like the aspect of uncovering family secrets from the past. I’m in a thriller mood, lately, but I find all kinds of books I want to read on Show Us Your Books day. Can’t wait to see what everyone has been reading! Hi, it’s been, what, seven months? No big deal. Ellie is pretty much a full grown adult at this point. 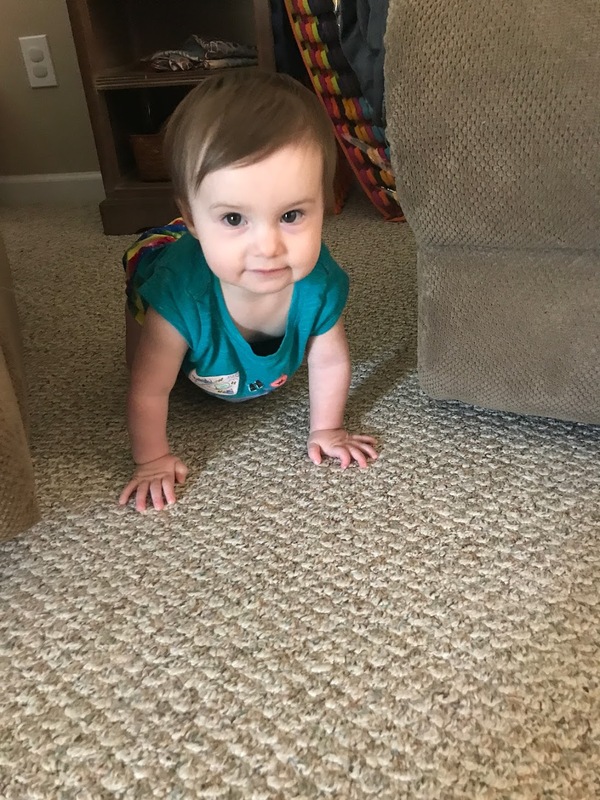 The last pictures I posted of her, she is barely walking, and now she’s a toddler – hello. 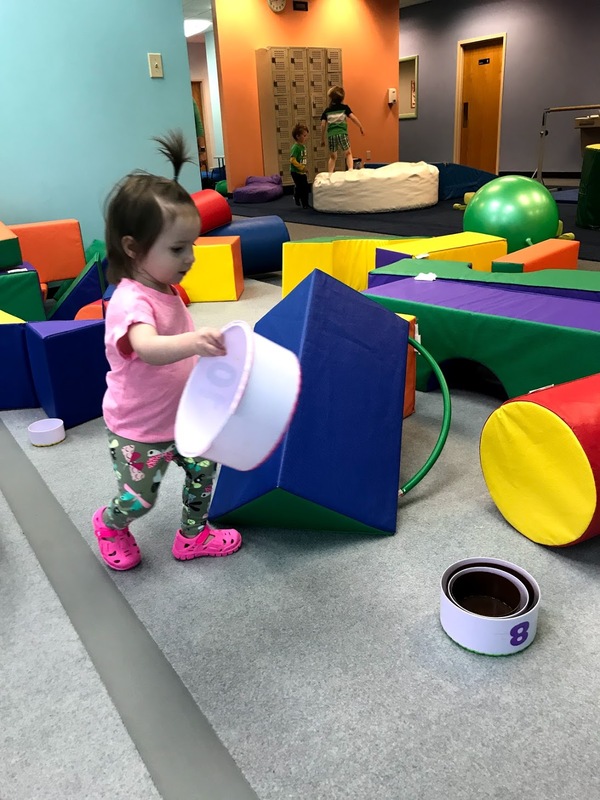 Here she is hanging out at the baby gym, taking care of some official business. 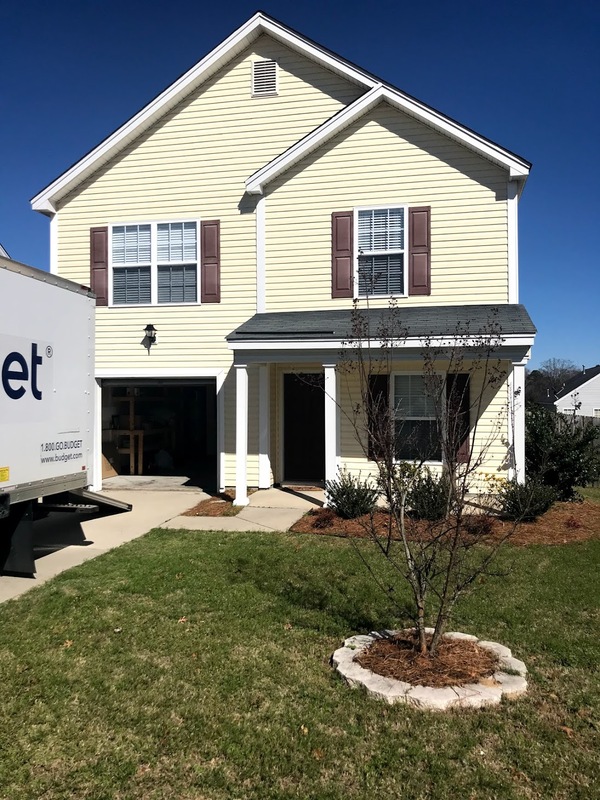 We bought a house, and apparently I was too lazy to take a picture of it without the Budget truck in front of it. Hey, did you know owning a house is a lot of work? We had to buy a lawn mower and a weed eater. And a dining room table. And I’m pretty sure Ellie still has more furniture than we do. Anyway, we love it – it’s great. I highly recommend NOT living with your mom and your husband and your child and a whole zoo of animals. At least not for too long. 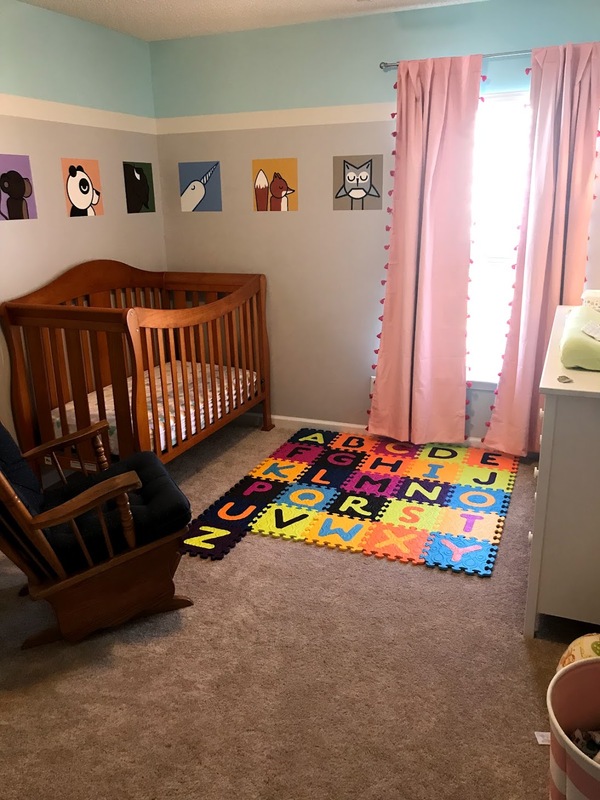 Here’s a picture of Ellie’s room, because it’s the cutest in the house. I changed that letter arrangement, because the extra Z at the end was driving me nuts. I am not sure what I want my blog to be at this point. I don’t have a ton of time for myself, so I’d like it to be an outlet and a way to keep in touch with the people I have met here. I’m still me, although a bit different – more feminist than pre-baby me (I will defend this girl and all girls to the end), a little less vegan (vegetarian now, see: I have little time, see also: I love food). You know what’s the worst (alright, it’s not the WORST) – I have read only eight books since the last time I was here. Two of them were ridiculously long. I’ll catch up on a book post at some point. I’m committing some type of book crime right now, and reading a book at the same time I am watching the TV show. 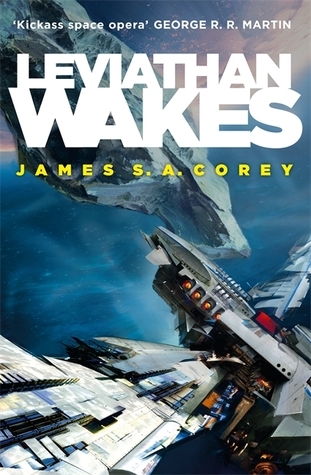 I started reading the first book of The Expanse series, Leviathan Wakes. I couldn’t wait to start the show, so I’m actually in season 2 of the show and behind in the book. It’s helping me imagine the characters and get a better handle on the plot, so I don’t mind. This weekend we are planning for some furniture shopping, because that just never ends. Also our bedroom is huge, which is great but what the hell do I put in a bedroom besides a bed and dressers? We are not in a huge rush, and if I wanted to, I could do some full-on acrobatics in that room right now. Sometimes I step up to Blogger and wonder what in the world to write about, because all I take photos of are Ellie. I’d take more pictures of other things, but I actually enjoy not taking a photo of everything we do, and a lot of the time I don’t even think about it. I feel like I live a million miles from the city now, so mostly we hang out or go shopping closer to our house. Once it gets cooler, I’d like to go to the zoo and maybe go into the city more. It’s a little too hot for Ellie right now. We actually probably live about 30 mins away, but it feels like much longer when you have a baby. Sick – blah! Ellie came home from her first week of daycare with a stomach virus that just won’t stop. It’s been nearly a week now and she is still sad and having an upset stomach after ever meal. Today’s actually the first day that her mood has been a little better and she has eaten a little more. The doctor said the bug lasts 7-10 days, so I’m hoping she feels better soon. I picked up a little cold from her but nothing as bad as what she’s got. She was totally cool at the doctor’s office, waving at people (who were actually not facing her haha), until the nurse came over and interacted with us, and then it was screams the rest of the visit. She is not a fan of the doctor, or strangers touching her. These pics are from two different days but apparently, I really like this outfit this week! Greg started work this week – yay! He’s got two weeks of training and he’ll start his job after that. I’ve been at my job for two months now and it’s been good so far. My boss was very understanding with Ellie being sick… I am not looking forward to taking her to daycare next week. Except for her being sick, I have enjoyed spending time with her this week. I think we better hunker down this weekend, because I have heard the eclipse traffic near us is going to be crazy. We are apparently right in the path and there are people coming from all over and booking hotels to see it. My work is only a 5 minute drive, and I plan to do a half day on Monday. 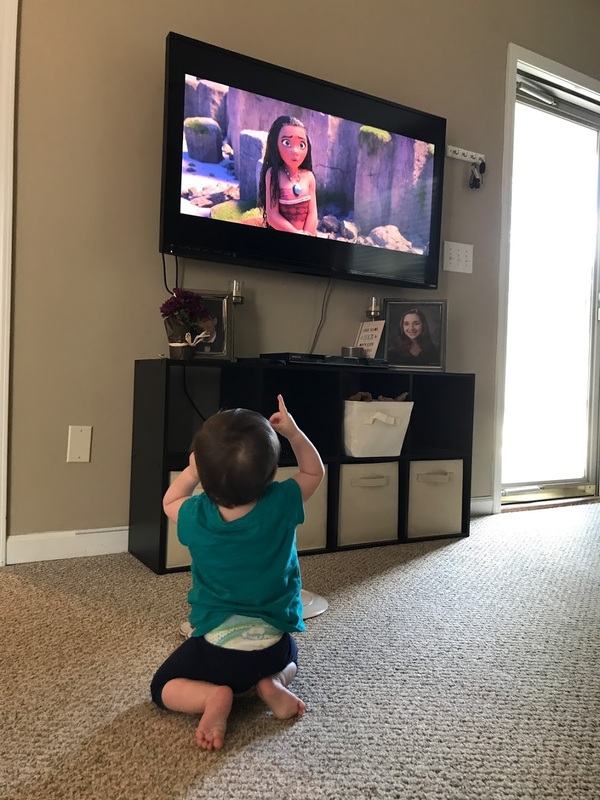 Moana on repeat. Ellie likes the songs and I love watching the animation – I hadn’t seen it before recently and it’s absolutely gorgeous. I love the songs, too. 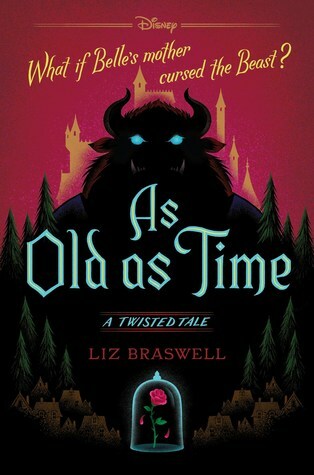 Tale as Old as Time by Liz Braswell. 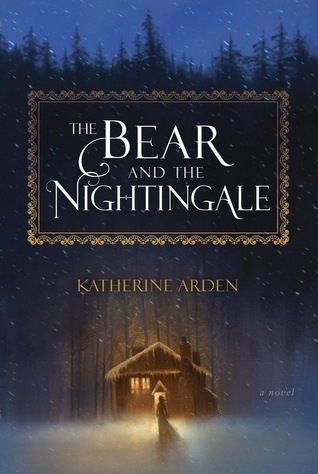 It’s a good read, so far – an interesting spin on Beauty and the Beast. I’ve got a couple books to pick up from the library but have felt more like spacing out on Facebook than reading since I’ve been sick. Mostly, I just want to sleep and not concentrate. I’m actually feeling better today than I have been – probably due to the downtime with Ellie and lots of Dayquil to help me breathe at night. We have been inside a lot lately because it is baking hot here in SC. I am looking forward to fall and winter, even though it’s going to be an adjustment for me coming from somewhere where we usually get at least several inches of snow at some point in the winter. I’m hoping I can still get into the fall & winter spirit here! I have a lot of updates I could talk about, but it’s Friday and that is a fabulous day, so I’m going to share some favorites. I don’t usually buy any clothes full price if I can avoid it, but I accidentally wandered out of the clearance baby clothes section at Target, and I had to get this shirt. It also has a cute tulip cut back – I’m so excited for Ellie to wear it. 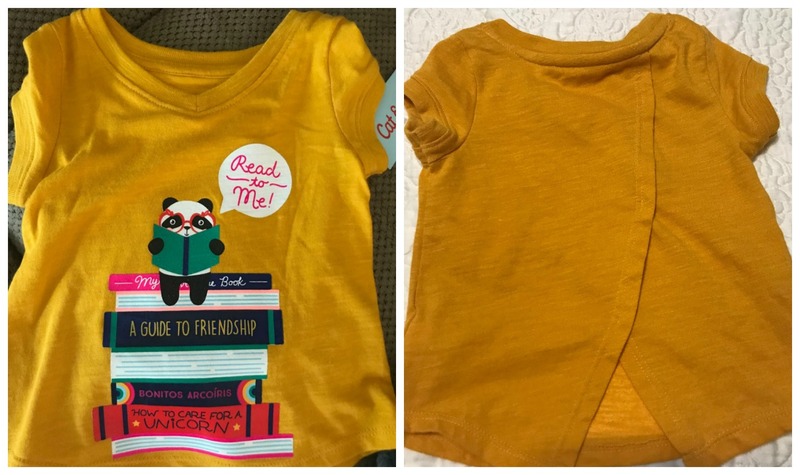 We found some cute tees on clearance for her – I stalk the baby section every week to see what’s new. Renpure Cleansing Conditioner – I heard about this conditioner which both cleans and conditions your hair, so you don’t have to use shampoo with it. So far, so good. 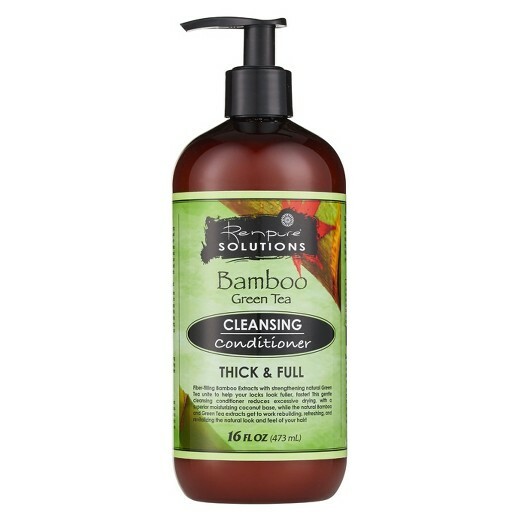 I have oily-prone hair, and it has been soft and not oily since starting to use this every other day. I’ve still been using regular shampoo and conditioner about once a week, just so I get a shampoo in but it may be fine without it. 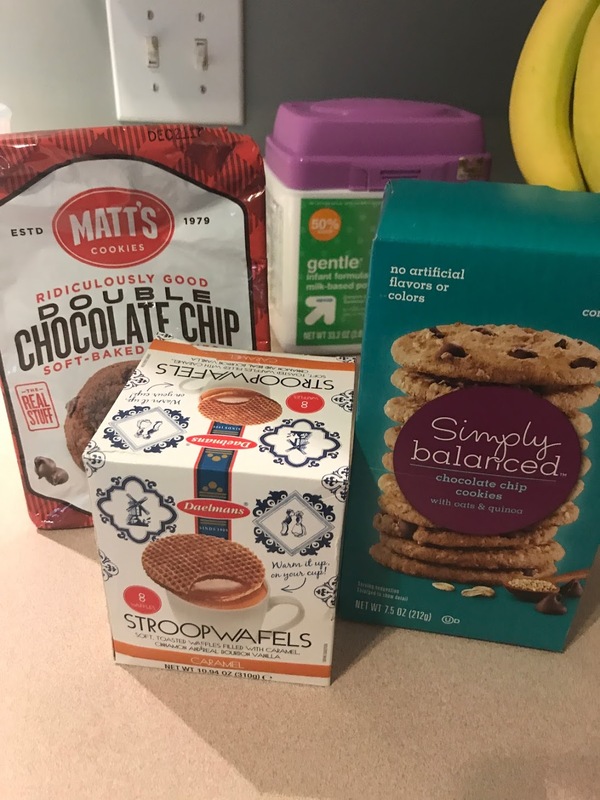 A magical mom friend online sent me a box of cookies! There was a story that involved Greg eating all the cookies and me complaining (I get hangry without dessert), so she sent me lots of cookies. I am thinking the stroopwafels look especially delicious. 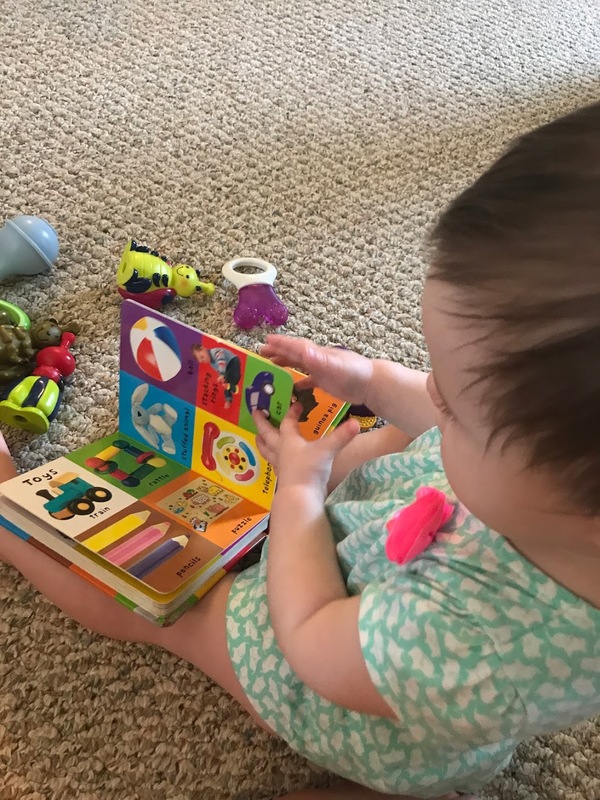 Ellie has taken a big interest in this 100 First Words book. She’s started pointing at the different pictures, and I like to read it with her. Greg built Ellie a dollhouse bookcase! 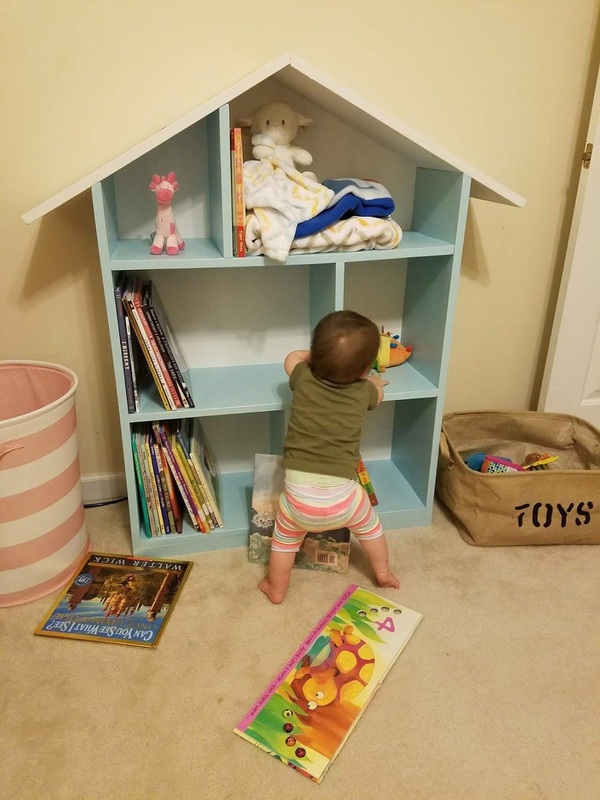 He’s really amazing at woodworking, and we’d seen these style bookcases on Pinterest, so he found some plans and we changed the sizes to work for what we wanted. It took a few weekends and now she has a custom bookcase! He did 99% of the work – I just made the plan on Photoshop and helped him paint a few parts. Have you tried any stroopwafels? 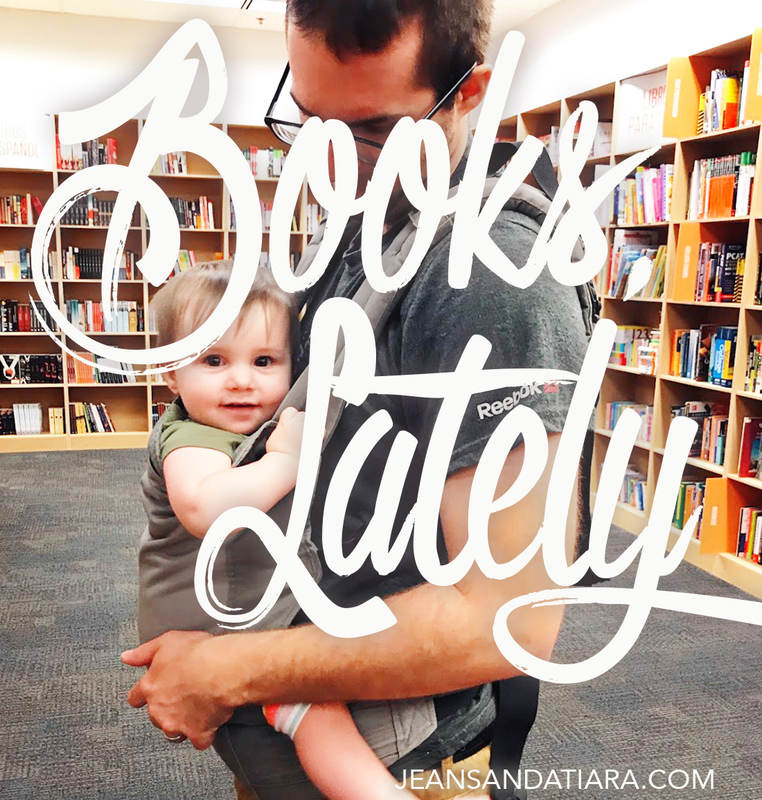 What books should I put on my baby book wishlist? Hope you have a fantastic Friday and weekend. I really love Show Us Your Books time. It’s the one of the only times I post, recently! 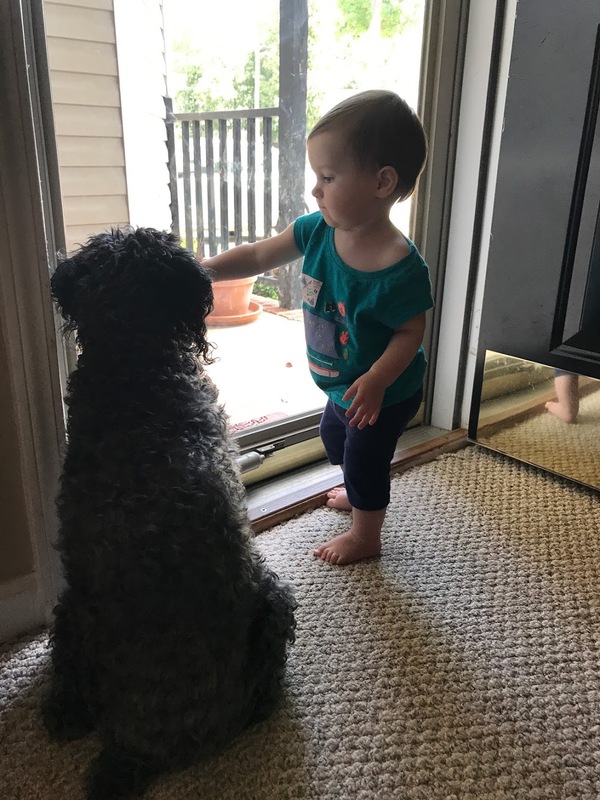 I’ll check back in with regular stuff sometime – long story short, Ellie started daycare this week (help us all, I am so worried!) and Greg is starting work next week. We have lots of changes happening and we are going to have to settle into an all new routine. 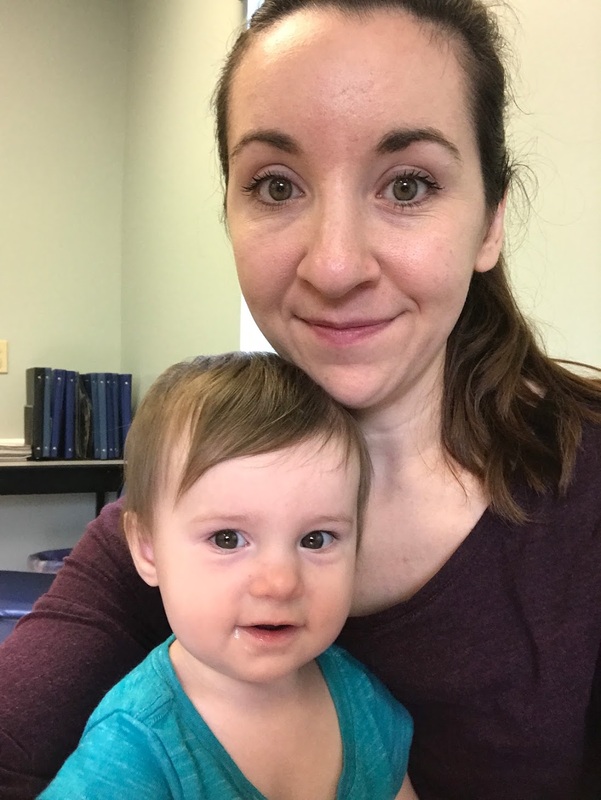 She also recently turned 10 months old – holy moly, almost a year. I read some great books this month, which all happen to be part of my choices for Erin’s book challenge. 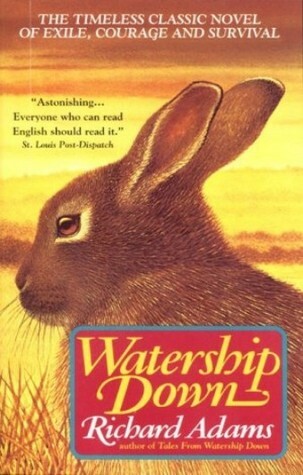 Loved this book. 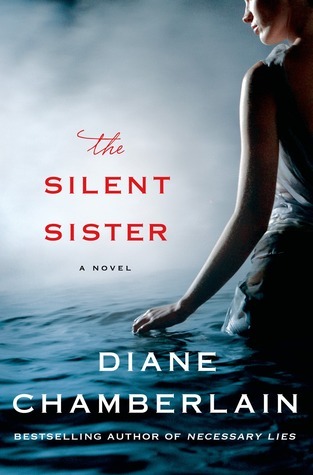 I liked that the author was able to present so many different viewpoints but with no doubt about how she felt. 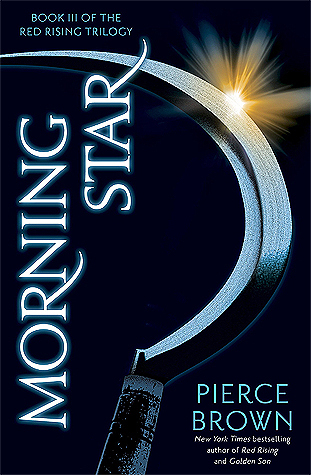 The main plot point happens early on and the rest is about the events that happen afterward. I think that the author said things well and it was heartfelt. 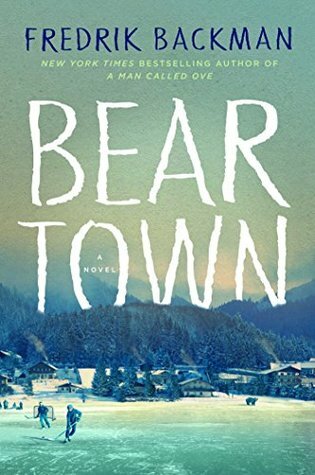 This was my first book by Fredrik Backman and I loved it. It’s about a small hockey town and the people who live in it. I loved the characters, especially Benji and Peter. I pictured Peter as Peter from Parenthood, another character I love. Side note, I enjoy watching hockey in person but have no particular passion for hockey and the hockey bits were not so important in the story. I’m not sure how to describe this one because it’s always been a favorite of mine. I love that the rabbits are so rabbit-like but also have human characteristics. I like the slight mystical element and the language invented for their kind. There is a new movie being made for Netflix that I am excited about, starring James McAvoy , John Boyega, Nicholas Hoult, and other fabulous people. I don’t remember seeing the older film but it’s known for being quite violent, which I did not find the book to be. It seemed more an adventure book with sweet characters to me. I highly recommend all of the books this month. 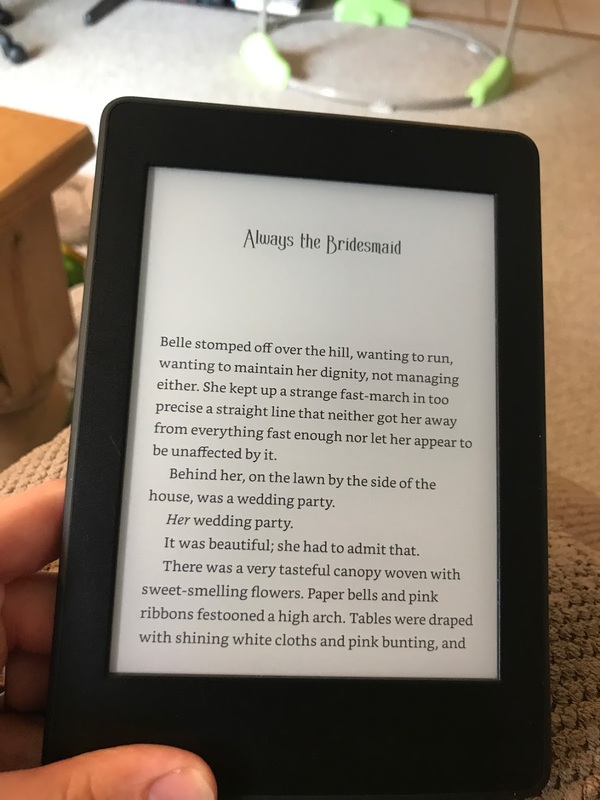 I’m linking up with Steph and Jana for Show Us Your Books.